The Autotype Fine Art Company Limited. 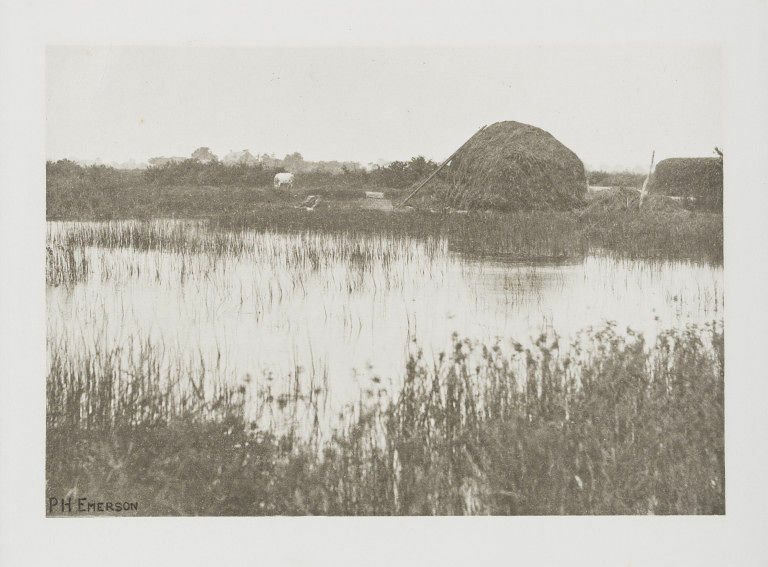 This 1887 portfolio is a poetic portrayal of East Norfolk. Emerson depicts the region as an ‘earthly paradise’ that is in harmony with the changing seasons; from the pleasure of men contemplating the forthcoming harvest in Spring, to the silence of landscape in the snowy Winter, viewers can experience the peacefulness of pastoral life for themselves. Emerson was particularly rigorous about printing processes and technical excellence. He favoured a photomechanical process called photogravure (or what he also referred to as ‘autogravure’, ‘copper plate engraving’ and ‘photo-etching’) for its ‘subtlety and delicacy’. He describes the 12 images within this portfolio as ‘printed from copper plates’ reproduced from his original negatives that were ‘taken directly from Nature’ – being faithful to what the lens had captured rather than creating artificial composites in the studio or dark room. He also specifies that in the process of reproduction ‘no retouching has marred the subtleties of Nature’s handiwork’. 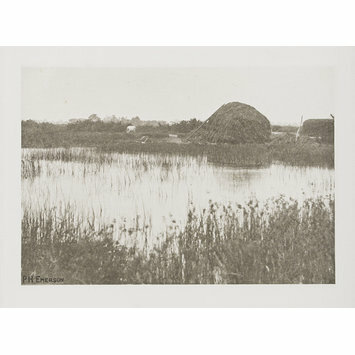 According to Emerson this photogravure is ‘an example of the charming bits of landscape on the edges of the broads. Our plate gives a grey day effect in early autumn’. Emerson points out that, in the background, there is a cow ‘grazing on the higher lands not yet flooded” and a “distant village, melting softly into the grey sky’. John Taylor The old order and the new: P H Emerson and photography, 1885-1895 Munich; New York; London: Prestel, 2006. 160p. : ill (some col). ISBN: 3791336991 / 9783791336992.